Pen and Paper: VICTORIA AND ABDUL: THE EXTRAORDINARY STORY OF THE QUEEN'S CLOSEST CONFIDANT. VICTORIA AND ABDUL: THE EXTRAORDINARY STORY OF THE QUEEN'S CLOSEST CONFIDANT. Are you someone who wouldn't even contemplate watching a film before first having read the book OR someone who prefers to watch the film then read the book? Are you someone who, having read the book, wouldn't want to see the film? (after all its rarely, if ever, as good) OR someone who, why bother reading the book, when you can see the film? We all have our thoughts on films that have been adapted from books OR, though less likely, books that have come about because of the film. Hmm! Do you know I'm not exactly sure where I stand when it comes down to whether the chicken comes before the egg OR the egg before the chicken the book should be read before the film is watched OR the film should be watched before the book is read. One thing I will say though is that, yes, generally speaking for me personally, the film very rarely lives up to the book. So, what would I make of Victoria & Abdul the book after having first watched Victoria & Abdul the film. I'm actually trying hard not to make a comparison, after all this is my thoughts on the book and NOT the film (my review of which can be seen here). What I will say though is, in my opinion, this is one of those rare times that I actually enjoyed both almost equally ... the film perhaps a little bit more. Anyway, now to concentrate on the book and the book only. VICTORIA AND ABDUL: THE EXTRAORDINARY STORY OF THE QUEEN'S CLOSEST CONFIDANT by SHRABANI BASU. Whilst writing the first edition of this book I was painfully aware that I had not been able to contact any of Abdul Karim's descendants. Victoria. A woman who has a dour public persona and yet passionate, caring, compassionate and seemingly not beyond enjoying (and indeed creating) some degree of contention as a means of relieving the boredom. Head of a somewhat dysfunctional family (to say nothing of not just a household of hundreds but, a country, an empire), her closest friend and confidant? Abdul, her Munchi. Disliked by her family; resented by her household staff; alienated from the fellow countryman also in her employ; her advisers suspicious of him; something of a sad and lonely figure when it comes to the royal Court and yet highly regarded, indeed loved, by some, not least of whom, Victoria herself. Loyal, charismatic and yet, hmm, a bit of a 'chancer'; someone not beyond manipulating her fondness of him(?). A book that provides a wonderful glimpse into the life of the ageing monarch who, after the death of not only her beloved husband but that of John Brown, once again bonds with a 'mere' servant ... and not just any old servant either. Using all the material (some of them the private papers of Victoria herself no less; others, long believed to have been destroyed, those of Abdul); the diaries, the journals, the scrapbook, the news paper cuttings at her disposal, Shrabani Basu's immaculately researched Victoria & Abdu offers a wonderful insight into a most unlikely friendship that not only crossed the boundaries of gender and class but also, she, so much older; British; the head of the Church of England; he, an Indian and a Muslim to boot, that of age, race and religion ... Talk about scandalous. Were people merely jealous of his friendship with the Queen; were they right to be concerned by how much she seemed to be swayed by him; just how much a part did prejudice and racism play? Engrossing, intriguing, thought provoking. My thoughts on Victoria and, especially, Abdul constantly changing. My only gripe, small as it is? Repetitive in places, I felt the editing could have perhaps been a bit tighter. We have this film in our Netflix queue and I'm really looking forward to seeing it. That said, it's not one I'd considered following up with the book - though you might have changed my mind with this review. I have not seen this film or read the book. Both sound good. I think that there are many films that I have seen that I enjoyed, but that I do not realky want to read the book. I have a much higher threshold when deciding what to read. Reading time is so scarce. I'll most likely see the film first. it sounds wonderful! I do tend to prefer to read the book before seeing a movie. I almost always want to see the movie of a book I've read if there is one--even knowing it won't be good. With movies, sometimes I want to see them, but have no interest in the book. I am glad you enjoyed this book! I haven't read the book or seen the movie. Maybe one of these days. I haven't read the book but I really enjoyed the film, a great deal more than I thought I would. I must admit that books stay on my TBR shelf for so long, that I am much more likely to have watched the film, before I ever get to read the book and by then I probably wouldn't bother with the written version. It is the same with reading books more than once. I often comment that I would like to read the Agatha Christie books, or some such classic series I read many years ago, again. However the reality is, that would probably never happen, as I seldom re-vist a book once read. In fact, I always donate a book to family or friends, as soon as I have finished it and seldom if ever, put it back on the shelf! 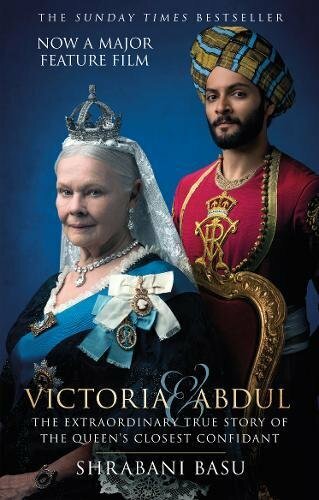 In the case of 'Victoria and Abdul', I have neither read the book, nor watched the film, but I think that the film would be the preferred option for me, as I always enjoy watching Dame Judy Dench's acting. of the film and added it to my list. (where people can rent or buy films). Perhaps I will watch the film this weekend. I generally pick one or the other or if enough time has passed that I don't remember the book - I'll see the movie. I've never read a book after seeing a movie. In this case I would probably just see the movie. Glad you enjoyed both though. I think that's sort of a rare occurrence with these things. I've I've read the book then I'll rarely watch the film (and visa versa). I hate picking at all the differences.